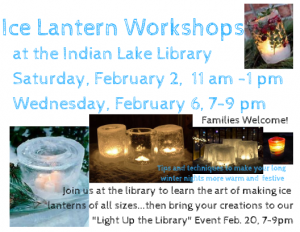 In anticipation of our Snocade “Light Up the Library” family event Wednesday 2/20 (7pm), we are hosting 2 fun workshops to show you how to make ice lanterns. Humble ingredients and cold temps combine to create beautiful luminaries to light up those long winter nights. Please register at the library to ensure we have enough materials for everyone or call 648-5444 for more info.